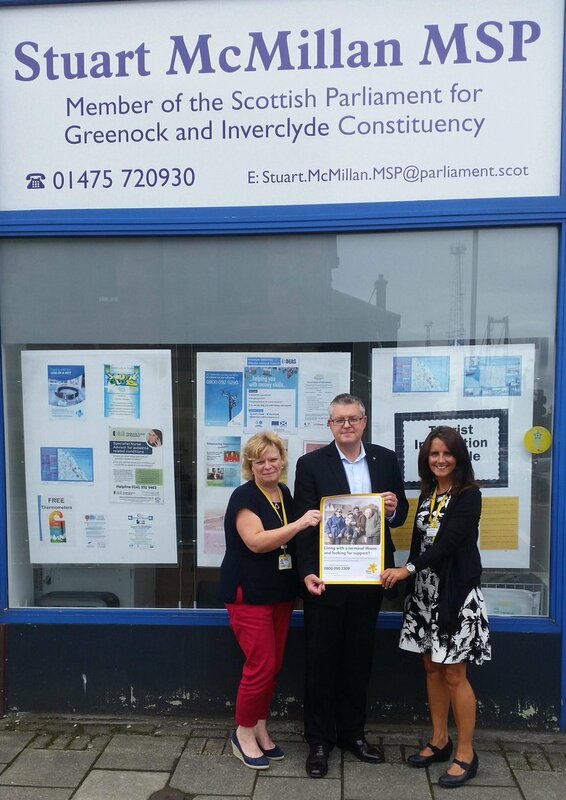 Stuart McMillan MSP is urging people across Inverclyde to support Marie Curie to improve the lives of people living with terminal illness by becoming local fundraising volunteers. Marie Curie is best known for its network of Marie Curie Nurses, who provide free one-to-one nursing care and support to people with a terminal illness and their families, in the comfort of their own home. But, the charity does much more. Marie Curie also provides a confidential support line, funds vital research on how to improve care for people at the end of their life, and campaigns around improving access to care services for everyone living with a terminal illness. Last year, working in partnership with Inverclyde’s Health and Social Care Partnership, the charity carried out 239 visits seeing 49 people in Inverclyde. Marie Curie relies on the generosity of the local community to support its nursing service through its volunteer led Inverclyde Fundraising Group and a local store in Port Glasgow. “I am very much aware of the excellent and vitally important work Marie Curie deliver locally on a daily basis and I pay tribute to everyone involved. “They couldn’t deliver the frontline work without the help of a volunteer base. “Locally, there will be many households who have come into contact with Marie Curie who have that experience of the care and dedication that they bring. “It is so important that everyone gets the care they need but sadly one in four people in Scotland aren’t getting that care. Marie Curie needs your support, so we can reach more people when they need us most.